What is this “Screen Shot” app using so much battery? The battery on my MacBook Pro drains very quickly compared to what other people report. When I'm running Slack, lots of Chrome tabs, and Docker for Mac and everything, that's to be expected. However, when I close everything I'm still seeing drain and the energy app say that a major consumer is "Screen Shot" but when I click on it, it takes me to Activity Monitor - which does not show anything called "Screen Shot". Does anyone happen to know what this is and what I can do to quit the app? Browse other questions tagged macbook battery power-management . How long should my MacBook Pro battery last? When running Windows (or Linux) on a Retina MacBook Pro, what resolution does it report? While my MacBook sleeps, the network drops off? What does an Apple “battery service” involve? 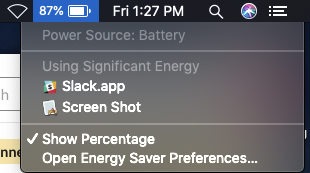 MacBook Pro with shot battery, possible to prevent CPU throttling?